Det Norske Fløyteensemble (DNFE), also known as The Norwegian Flute Ensemble, was founded in 2008 by Jørn E. Schau and Hege Katinka Ludvigsen with the aim to establish a musical focal point for the flutists in the Southern region of Norway. At the very beginning, the core members of the ensemble were primarily past and present flute graduates from the Music Faculty of the University of Adger (UiA). 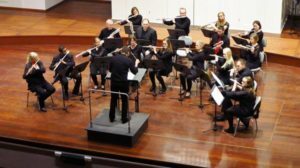 But as the ensemble developed, there are more and more flutists across Norway are joining into the bigger family which some of them are professionals hail from local orchestras such as the Kristiansand Symphony Orchestra (KSO). In light of promoting flute music both locally and internationally, DNFE strived to offer regular concerts and workshops to the public and other aspiring flutists alike. To date, they have performed in numerous occasions around Norway as well as making appearances in flute festivals and concerts in England, Estonia, France, and Poland. For examples, the DNFE was invited to perform in the 4th International Flute Festival at Poznan, in 2013. Amongst some of the highlights during the concert, the ensemble get to showcase a new piece written by Konrad Øhrn, called ‘Dances’, as well as a special arrangement of Vivaldi’s ‘Concerto for 2 Flutes in C major, RV 533’ with soloists Patrick Gallois and Ewa Murawska. And most recently, DNFE were honoured to have performed W.A Mozart’s ‘Andante in C major, K.315/285e’ with Peter-Lukas Graf, one of the 20th century’s finest flute players, during his visit at UiA in February 2016. Within the wide genre of music that DNFE have performed thus far, Co-founder and Music Director, Jørn E. Schau, has been actively searching and commissioning composers to write original works for flute ensemble. In the quest of unearthing new music, the ensemble has received and premiere handful of new music spanning from local composers such as Hans Magne Græsvold, Terje Mathisen and Trygve Madsen to international prizewinning composer like Philippe Dulat. Some noteworthy pieces including ‘Vitrail’ by Dulat which DNFE has performed it at St. Maximin and Cogolin in Southern France respectively, and ‘Kjerulf-Suite’ by Mathisen as a tribute to Halfdan Kjerulf, Norway’s first composer to receive international recognition, for his 200th Anniversary. On top of dishing out interesting music programmes, DNFE also conduct educational workshops such as the Flute Weekend orFløytehelg. As the name would have suggested, there will be a 2-days long weekend music camp for flutists from high school and below organised by the flute ensemble every year. Young flutists will get to learn the art of flute playing and experience working with other flutists from different part of the Southern regions. 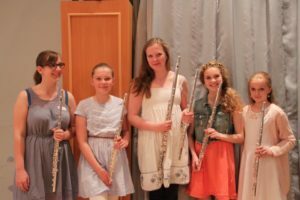 These workshops have successfully attracted more than 30 young flutists every year, and optimistically the number is still growing. Of all these interesting events, the proudest achievement of DNFE is to have produced 4 albums with the first one dating back to 2009, a year after its establishment. The first album is called ‘Perler fra Barokken’ which consists of a variety of baroque music by J.S Bach, G. F. Händel and A. Vivaldi. It was a humble self-made recording that would have inspired DNFE to attempt more albums in the future. Subsequently, the flute ensemble have partnered up with an indie label EMK (Ein Mangfaldig Kar) to record their second album entitled ‘From Norway’ in 2012 featuring Norwegian compositions, and their third album ‘Drømmen om Glade Jul’ in 2015 covering a collage of Christmas tunes. Looking forward in 2017, DNFE is in the midst of pushing out their latest album featuring ‘Sonata for Eight Flutes, Op. 58’ by Andrew Downes and ‘Pastorale’ by Charles Threatte. It is a great honour for DNFE to receive an invitation by Henrik Svitzer, Flute Professor at the Royal Danish Conservatory of Music, to premiere a new arrangement of the very famous ballet, ‘Petrushka‘ by Igor Stravinsky, at the National Flute Association (NFA) Convention 2018. This is a one of its kind arrangement done by Juliette Dominski and will be published by Edition Svitzer. The visit to the convention will also mark DNFE’s first overseas appearance after a decade since its establishment.